Let’s make Friday a day to look forward to in The Dalles! Come down on your lunch hour, or meet friends visit the market and have a coffee date afterwards! Join us downtown and help make it the place to be on Fridays. The Downtown Market will be starting June 1 every Friday until October 19. The Market opens at 9:30am and closes at 2:00pm. Vendors can start setting up at 8:00am and takedown is at 2pm to 3:30pm. The market will be located on Washington Street between 1st and 2nd streets. We will be using the back part of Washington Street to start hoping to expand as more vendors participate. Anything you make, grow, gather or bake. Do you make cool jewelry or fun items from upcycled supplies? Farmers, food producers, bakers, clothing that you sew or even upcycle. Get creative. Do you have a home based business like Mary Kay or Lularoe? Antiques, wood crafts, gently used clothing, whatever you can think of. Are you an artist or take awesome photographs? An added bonus is one of the largest river boats is docked on two markets every month and passengers have a bus stop right at the corner of Washington Street. Guess where they will go first? Don’t forget non-profits! You are welcome too. Space for up to 5 nonprofit groups will be available at each market. So use us to get your message out! Or use it to make money selling something. River Boat Season 2018 is Here! Our first cruise ship came into dock a few weeks ago. Of course the Floozies and I were there to greet them. This year will be busy with almost 116 dockings between the city dock and the port marina. There will be mornings where we will even have two ships here at the same time. Of course the Floozies will be there to greet both ships as will I and another helper from The Dalles Main Street. So who are these cruise ship companies? They vary from the large paddle wheel boats to the smaller sport minded ships from companies like National Geographic and Uncruises. 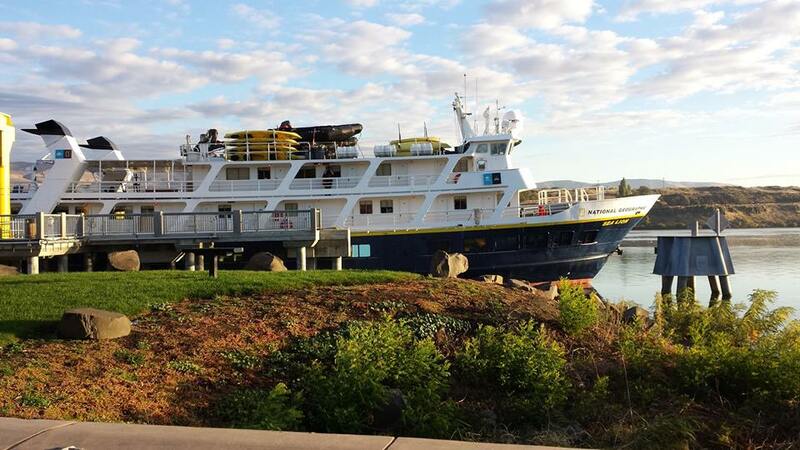 The larger ships start the season here on our Columbia River. The smaller ships start the season up in Alaska and work their way down to the Columbia River starting around September. The largest ship is the American Empress with American Queen Steamship Company. It holds up to 250 passengers and this year will stop once a week in The Dalles. Thursday’s and Fridays will be docking days for them. The second largest ships come from American Cruise Lines. The Queen of the West with 120 passengers and 47 crew members. The American Pride holds 150 passengers and 43 crew members. Docking days are varied for both ships and times are anywhere from 8:30am to 1:30pm. The Next is the S.S. Legacy. It holds 86 passengers and 34 crew members. The Legacy is one of our favorites as they always treat the Floozies to coffee after the passengers have left on their shore excursion for the day. There is rumor of a new ship from Uncruises visiting us this year. The Wilderness Discoverer hopefully will be visiting us sometime in October. Last but not least are the ships from National Geographic. We should be seeing three ships this year: The Quest, The Sea Bird and The Sea Lion. The Quest looks a bit larger than the Sea Bird and Sea Lion at 100 passengers. Can’t wait to see it. The Sea Bird and Sea Lion both have 62 guests. So now that you know who is coming, what are they doing here? The Discovery Center and Maryhill Museum are usually first on the list. I believe the Maryhill Museum trip is a premium trip costing extra as well as the WAM museum in Hood River. After visiting the museums, the passengers are back for lunch and are free to visit downtown on their own. Most likely you will see passengers from the three largest ships wandering around town as well as the crew. The smaller ships keep their passengers busy with excursions and not much free time is available. So welcome to our River Boats for a new season! It isn’t everyday your boss buys you cruise ship tickets. Kendall must be unusually lucky because that exactly what happened. Kendall is the awesome baker at Kaino’s Coffee and Marten Boyden is an owner of the new coffee shop on Second Street. Martan generously purchased five raffle tickets for our big fundraiser with American Queen Steamship Company and gave two tickets to Kendall. The tickets were donated by John Waggoner owner of the cruise line.